Geo-Sys is a research and consulting firm that focuses particularly on environmental, socio-economic and geo-spatial studies and services in the Lower Mekong Sub-Region. It carries out research and development, impact assessment studies and the formulation of natural resources management strategies in the context of integrated and sustainable rural development. 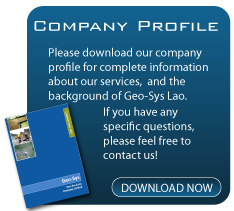 proprietary to Geo-Sys (Lao) Co., Ltd.